My mom decided to take advantage of my love of baking recently to make her a coffee cake. She had tried some at work and wanted the recipe, and when her coworker told her she’d found it on Pinterest, well, you can guess what happened next. Mixing up the wet ingredients. Have I mentioned lately that I LOVE my KitchenAid mixer? Now this recipe does not call for any chocolate, so I was quite disappointed and while I’d be willing to make it again if someone asked me to, it’s not something I would just up and make. Mostly because I’m not a huge fan of coffee cake. My dad, however, devoured it. In the end, it came out quite nicely! There was a bit too much of the “streusel”, and you need to watch where you put it in the pan. As you can see, because I flipped this upside down when it was done, all of the yumminess ended up on the bottom, and the layer in the middle wasn’t quite in the middle! So this is a good recipe, all in all. Needs a bit less struesel, and it needs to be spread out a bit more evenly. My dad would have liked it if I’d ground down the walnuts more, but that depends on if you’re a fan of big crunchy pieces or not so much. 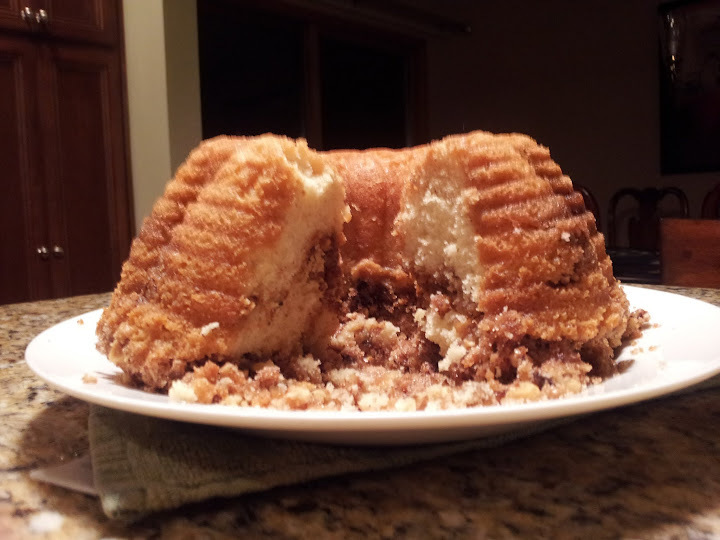 Perhaps next time, I’ll use just a square pan instead of getting all fancy with the bundt pan! This entry was posted in Be Happy and tagged Cake, Pinterest, Pinterest test, Recipe. Bookmark the permalink.